by The Mechanic's Wife | May 10, 2016 | Did You Know? In part one of this series, I explained why you should consider driving your car for 300,000 miles and beyond. This article includes some practical tips on how to stay on top of the general maintenance of your vehicle. What Should I Consider Regarding Auto Maintenance? Most people are aware of this maintenance item if no others, but they don’t always keep on top of it like they should. It’s very common to see oil changes done late. Motor oil has a lifespan, and running the oil past that lifespan can cause premature engine damage or failure. It’s not that one day the oil is fine, and the next day it’s not and the engine seizes. Oil break-down is a gradual process and so is engine wear. 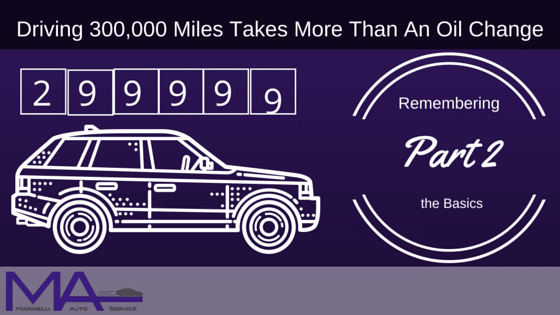 Late oil changes (or oil changes with the wrong oil or cheap filters) run the risk of what could have been a 300,000 mile motor failing much earlier, but if the motor still runs past 100k miles, people don’t always realize that they hastened its demise. Thousands of dollars for a new engine vs $40-100 for an oil change every 3,000-10,000 miles is incomparable. You should also keep an eye on your oil between changes. Check the level once each month. You may never see the level drop, and that’s a good thing, but if the time comes that the level has dropped, you know that the engine may have started leaking or burning oil, and hopefully you’ve caught the problem before the motor is run low on oil. Coolant, transmission fluid, and brake fluid are all just as important to keep your vehicle running smoothly, but they don’t have to be changed nearly as often as engine oil. Manufacturer maintenance schedules, combined with the advice of a skilled mechanic, will help determine replacement intervals for these fluids. Additionally, window washer fluid is important for providing optimal visibility while driving. Old windshield wipers can create streaks on your windshield that obstruct your vision. If they are barely working, driving on a rainy day could be quite dangerous. I once saw a guy trying to manually wipe off his windshield while driving through a rainstorm! Not only was his vision impaired, but he was also very distracted…and very wet! Streaking wipers can also leave enough water on the windshield to blind you if the sun hits the water at the right angle. Driving in the Florida sun, this is something to be cognizant of. The engine air filter prevents debris and pollutants from entering the engine and damaging engine bearings. In extreme cases, debris may bypass a severely clogged filter and still get into the engine. A severely clogged filter can also affect the engine’s ability to breath and perform. I remember once in college, I took my parent’s Jeep Grand Cherokee for a little off-roading adventure with my friends. When I returned it to my parents, they took it for an oil change and the technician showed them the filter which was filled with sand from my adventure. It was promptly changed. The cabin air filter, likewise, keeps all the stuff in the air outside from coming into the cabin through the vents to keep you and your passengers safe and comfortable. Driving on bald tires or tires with diminished tread reduces the traction of the tire on the road and increases the risk of losing control of the vehicle, particularly in wet conditions, and lengthens the safe stopping distance. Your mechanic can measure the depth of your tread to help you determine if they are in need of replacement. Once they are replaced and balanced, you should be set for tires for a few years. If the tread from your old tires did not wear evenly, you should also have an alignment performed. Otherwise you’ll end up having to prematurely replace the tires you just had replaced! Additionally, you should check your tire pressure on a monthly basis. This may sound counter-intuitive, but low pressure increases the risk of a tire blowout. This can be caused by excessive flex damaging the tire sidewall, or the tire overheating due to increased friction against the road. Tire blow-outs can cause you to lose control of the vehicle and are especially dangerous at high speeds. These little guys are what ignites the air/fuel mixture to start and run your engine, similar to a match lighting a candle. They can collect residue over time or lose their proper gap and will not work as efficiently, at which time they should be replaced. Maintenance intervals for these plugs can range from 30k to 100k miles and beyond. This is what synchronizes the rotating components of your engine so that the engine’s valves open and close at the proper times. A musical group will sound terrible if each instrument is playing out of sync with one another, but an engine out of time can have serious repercussions. Servicing your timing belt on a maintenance schedule will prevent it from breaking while you are driving, leaving you stranded on the road, and likely damaging other components in the engine. I should note, many vehicles have timing chains rather than belts. Timing chains are not a maintenance item while timing belts are. Check with your mechanic if you aren’t sure which your vehicle uses. Brakes wear out over time. Checking the thickness of the pad on a routine basis will help you to know how quickly they are wearing and at what point they need to be replaced. Not all brake noises represent a safety issue, but we do recommend checking in with your mechanic if you hear brake noise. For your own safety, and that of those around you, you don’t want your brakes to go out while you are on the road. How Do I Know What Maintenance Schedule to Keep? This may seem like a lot to stay on top of, but your mechanic can help you determine what needs to be done and when each time you go in for service. Your owner’s manual should contain a maintenance schedule, but your mechanic also has access to it through his service information database. Maintenance schedules are helpful guidelines, which should be interpreted with the help of a knowledgeable mechanic. Once you’ve determined your maintenance schedule you can use a mobile app to help you remember when to schedule your next service. You can also usually check off a few maintenance items in one visit, which could save you money, but also time. No maintenance schedule is perfect. You will still encounter necessary repairs, but keeping to the schedule may save you a lot of heartache. The attention to the car can unveil unknown issues. The mechanic may notice a strange noise or something leaking that you weren’t already aware of. It’s better he notices a problem at that time than for you to discover it after being stranded on the side of the road.